Home Christmas We Wish You A Merry Christmas! All of us here at Philip Morris and Son would like to wish our fantastic customers a very Merry Christmas and a Happy New Year. 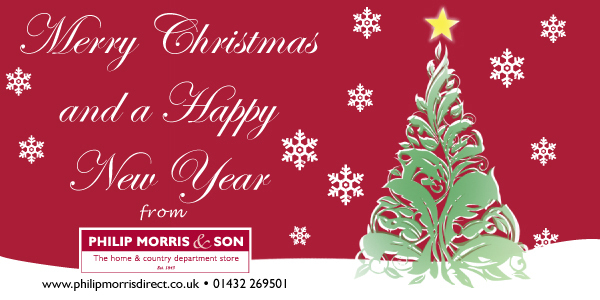 Thank you for shopping with us in 2013, may 2014 be another brilliant year for everyone – we look forward to your continued support. That is why at the end of each year we bring you the best SALE we possibly can, and it is on now! Don’t miss out on huge price cuts on clothing from Barbour, Musto, Dubarry, Schoffel, Le Chameau, Hunter and more! Barbour Sale, Christmas, Dubarry Sale, Hunter Sale, musto sale, New Year, Sale, Shopping, Thank You. Bookmark. I was looking for some inspiration for my wishes collection, and found some here 🙂 Thanks!